That’s in the middle towards the bottom of India. It is technically towards the top of the South. Well that’s all well and good says you, but my geography’s a bit hazy. So, if it’s been a while since you looked at a map and all these Indian places are confusing you – here’s a map of India. It’s a nice map. I like maps. Should you also be in Bangalore – here’s some helpful info from those nice people over at expat arrivals. Click on their logo and you’ll be whisked to a land of information and facts about Bangalore. The people over at expatsblog.com also have lots of information for the freshly arrived. They’re very nice over there – and they gave me an award. Look, it’s all shiny and bronze. Next year, I plan for it to be a bit shinier. Or if reading other blogs about India is your thing – check out those equally nice people over at Internations. They’ve got a guide to India too. As have those lovely people over at expat-blog.com. 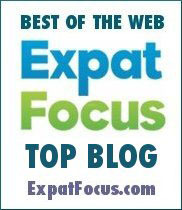 Not to be confused with expatsblog.com. They’re kindly featuring us over there as well. 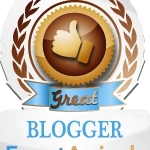 And now the blog’s been chosen as one of the top Indian blogs over at Indiantopblogs.com. Admittedly they’ve chosen over 500 for the honour, but apparently they claim to have been discerning about who went in and who didn’t. Over 200 of last years list have gone off the boil and not been listed this year. Not here of course, oh no: we’re going from strength to strength over here, eh? Anyway, seeing as the blog wasn’t listed last year, but is this year: they’re obviously doing a bang up job of finding the good stuff. Ahem. We’ve also won an IBA which apparently stands for Indian Blogging Award. 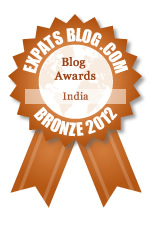 We’ve won in the most niche, of niche areas – best blog about India By a Non-Indian. Sigh. But you know, nice to win. And people kindly voted for the blog, so there was actual competition and all. So that is nice. How kind people are.